Twitter met or surpassed many of the diversity and inclusion goals it set for itself for 2017, the company announced today. Twitter is now 38.4 percent female, compared to 37 percent in 2016. Regarding underrepresented minorities at Twitter, representation increased from 11 percent in 2016 to 12.5 percent in 2017. Though, Twitter’s process for defining URMs is to include people who declined to self-identify, which is a undoubtedly a weird way to do things. 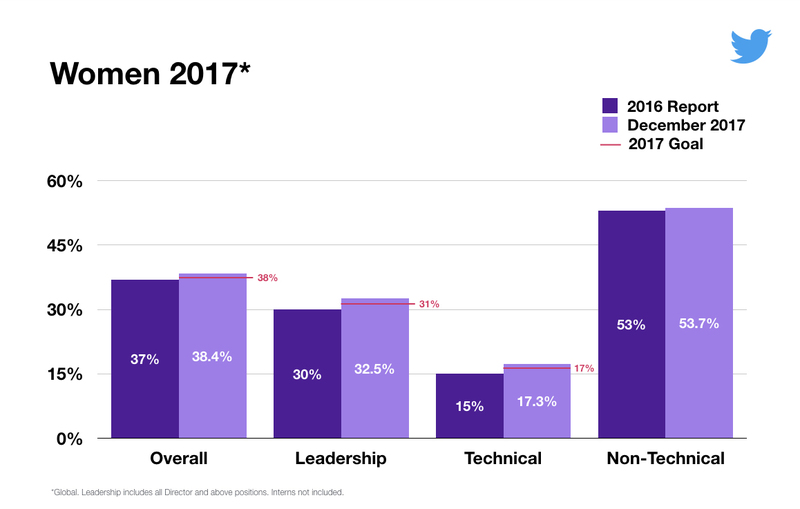 At the leadership level, Twitter went from 30 percent female in 2016 to 32.5 percent female in 2017, and underrepresented minorities now account for 10.1 percent of employees at the leadership level, compared to just 6 percent in 2016. Twitter is also now specifically looking at increasing the representation of women, black and Latinx people — groups that continue to be underrepresented in tech. Twitter is 3.4 percent black, 3.4 percent Latinx and 38.4 percent female. By 2019, Twitter wants to be 43 percent female, 5 percent black and 5 percent Latinx. Twitter brought on Castleberry Singleton last June as VP of diversity and inclusion. Her hiring came a few months after Jeffrey Siminoff left his position as VP of diversity and inclusion at Twitter. Today, as part of the new strategy, her role is known as VP of Intersectionality, Culture and Diversity. As part of this ICD strategy, Twitter launched an internal campaign called #GrowTogether to encourage employees to make personal commitments to inclusion. Part of the campaign entailed a listening tour at Twitter’s offices to better understand how people experience inclusion.